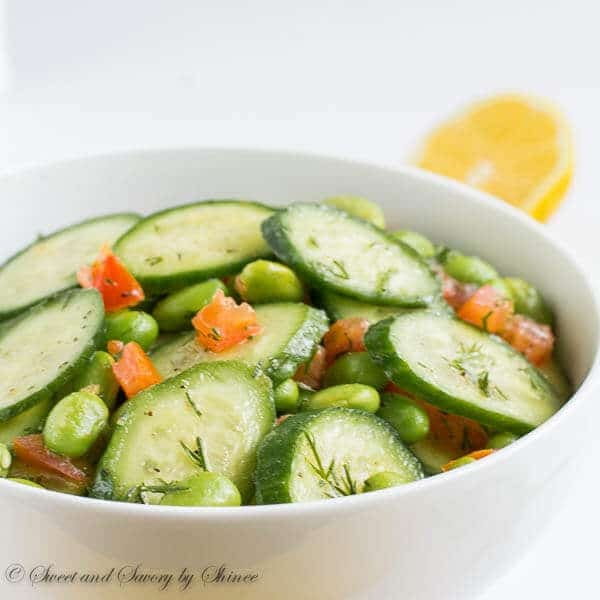 Fresh and flavorful cucumber edamame salad is simple, yet satisfying! It’s your must try spring salad. I love grocery shopping. Truly! I didn’t realize this until I had my baby boy. The first two months post-partum, my in-laws and Garrat did all the grocery shopping for me. It was great, but I missed going through the isles and picking each and every produce myself. Well anyway, one time I sent Garrat to the store with a long list of produce, he brought me a bag of mini cucumbers instead of zucchini. Not that he had confused the two (after all he’s a botanist! ), but he didn’t find zucchini, so he bought cucumbers. Not sure about his logic there. 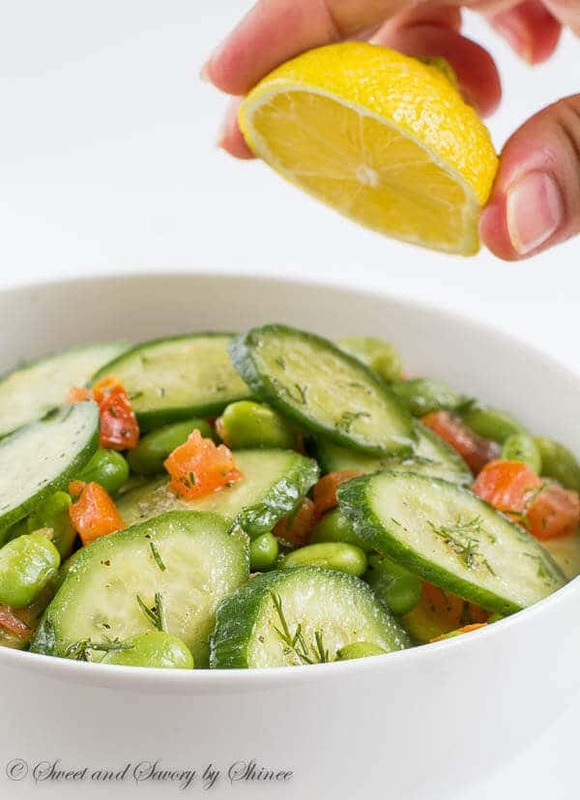 But I’m actually so glad he did, because the next day when I was watching Food Network, Giada was making this awesome cucumber salad with mini cucumbers! It was fate, I had most of the ingredients on hand and simply had to make it! With a few adjustments I made the salad and immediately fell in love! It felt like spring! So light and fresh! The ingredients are few and simple, but all the right ones. I’ve made this recipe quite a few times. And I noticed the kind of cucumbers makes quite a bit of a difference. Mini or english cucumbers work best for this recipe, as they’re sweeter and seedless, not to mention how pretty they look. As for tomatoes, go for whatever you have. I think Giada used cherry tomatoes, but I only had roma tomatoes, so I used those, just without seeds. And the 3rd main ingredient is edamame. You can totally use frozen edamame, that’s what I used here. It adds not only delicious flavor, but also great texture. 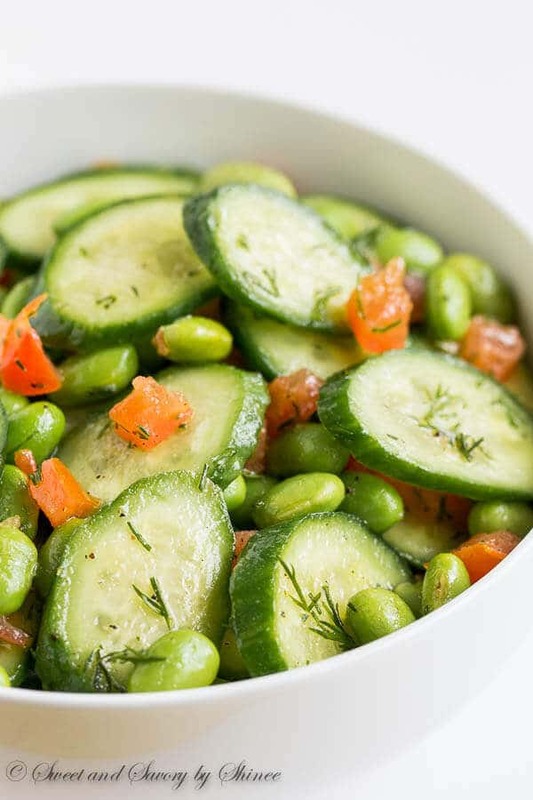 Without edamame this salad seemed lacking big time! All these are tied together with simple olive oil, lemon juice dressing. And since I love lemon so much, I usually use a generous amount of lemon juice, but you adjust to your taste. Whatever you do, use freshly squeezed lemon juice though. No out of container stuff here. Lastly, let’s not forget about fresh dill. It adds ton of fresh flavor that nothing can’t replace. Give this salad a try this spring. I just know you’ll be making it all summer long. In a large bowl, combine olive oil, lemon juice, salt and pepper. Slice the cucumber into thin disks. Halve the tomatoes and scoop out the seeds for another use. Dice the remaining tomatoes. 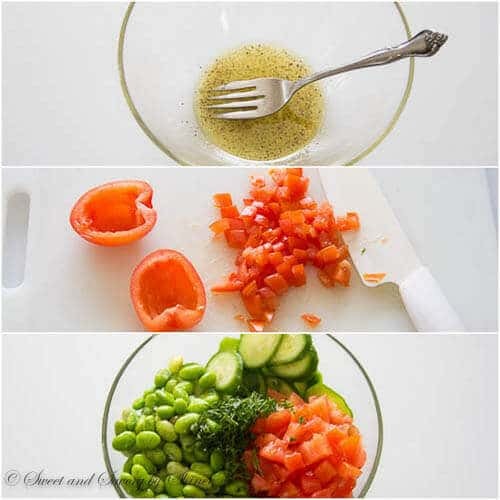 Add the cucumbers, tomatoes, edamame and dill into the bowl with olive oil mixture. Mix until well combined and serve immediately. 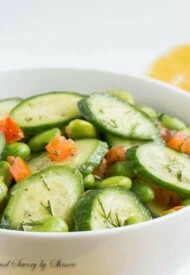 Adapted from Cucumber Salad by Giada DeLaurentiis on Food Network Show.